Students from St. Patrick’s School visited the Shrine of Kateri Tekakwitha and the Shrine of Our Lady of the Martyrs. Having spent several weeks learning about soon-to-be St. Kateri Tekakwitha, Matthew Pennise and more than 100 of his schoolmates were excited to make the pilgrimage to Auriesville and Fonda, N.Y., to visit the birthplace of the saint and the national shrine dedicated to her. The Shrine of Our Lady of Martyrs in Auriesville is dedicated to the North American martyrs and marks the site of St. Kateri’s birthplace. Students toured the sacred grounds and attended Mass in the huge, circular coliseum. Elizabeth Lucas, a 5th grader, said her favorite part was walking down into the wooded ravine where martyr St. Isaac Jogues buried his companion St. Rene Goupil. “You could really feel the saints there,” she said. Just a stone’s throw away at the National Shrine of St. Kateri in Fonda, the students inspected Native American artifacts and visited the site of St. Kateri’s village, which was discovered and excavated in the 1950s. They also visited the stream where St. Kateri is said to have been baptized. Though he didn’t touch the water, 5th grader Nate Jennings said it was still “pretty cool” to be in a place where a saint had been. On October 31, St. Patrick’s School students and faculty again boarded buses, this time heading for the St. Marianne Cope Shrine and Museum in Syracuse, N.Y.
“We were happy to continue our studies of St. Marianne by seeing firsthand some of her belongings and pictures,” said Brown. Many of the Catholic schools joined in the excitement surrounding the canonization of Marianne Cope with various activities to celebrate the historic event rooted in the Syracuse diocese. 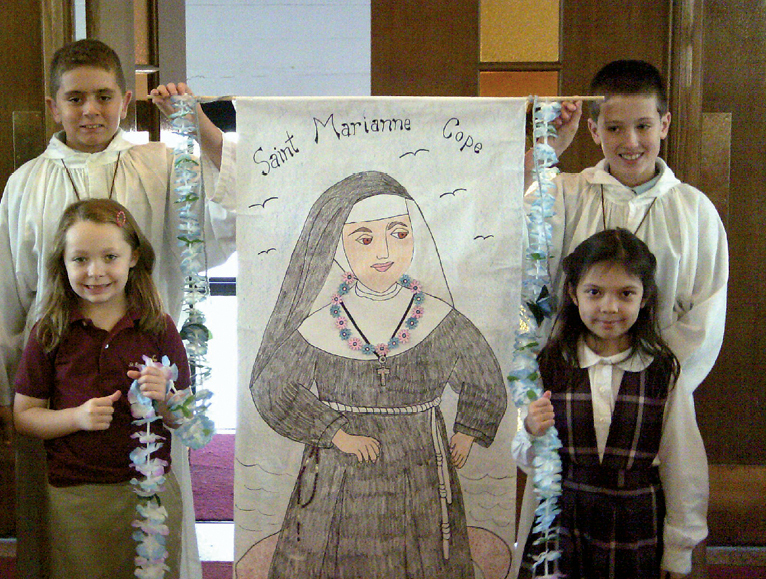 Students from St. Rose of Lima School marked the occasion with a mass honoring St. Marianne. The banner was drawn by Sr. Laurita Kelly, a member of the Sisters of St. Francis. Rev. Richard Kapral celebrated Mass for the students at the chapel on site, after which he blessed St. Marianne medals — brought home from Rome by Catholic Schools Superintendent Christopher Mominey — for each student and teacher. 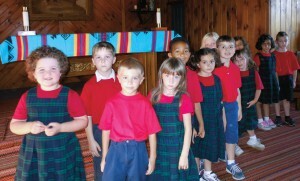 Brown said the students, as well as faculty and families, have gained much through their studies of the local saints. In fact, three families have made return trips to Auriesville since the students’ initial visit. The school will continue to study the examples of saints throughout the Year of Faith, and Brown has additional activities planned — including a visit from Sharon Smith, whose miraculous medical recovery cleared St. Marianne’s path to sainthood.